Choose which track you want to remix... or have a go at both. MusicRadar has teamed up with online mastering innovators LANDR to create two massive remix contests in one. We're giving you the chance to work dancefloor destroyers from Manuel De La Mare & DJ Diass or Butch & Hohberg - or both, if you're feeling extra inspired. 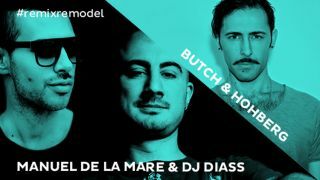 You can put your personal stamp on Manuel De La Mare & DJ Diass's unreleased club banger Nothing (forthcoming on 303Lovers) or rework Butch & Hohberg's tripped-out Rebirth (out on Otherside). In return for you showing us your skills, you could win some serious prizes, including invaluable feedback on your remix and hot gear from Keith McMillen. Winning entries will be announced by MusicRadar and LANDR, with the grand prize winner's remix featured on both sites. Download your stems today and submit your remix by Monday 24 November at 11:59 PM EST. Remixes will be judged on originality, production chops, dancefloor destruction potential and overall vibe. The selection committee includes a seasoned panel of producers, with the final winners chosen by the artists themselves. Winners will be announced on Tuesday 9 December. Submit your entry through LANDR's contest page to give your remix the final polish of professional mastering. LANDR revolutionises the mastering process with drag-and-drop simplicity, achieving results that its developers claim can rival professional studio work in minutes. By submitting your remix through LANDR, you'll score a free account. Preview the results and hear the difference for yourself! Grand prize winners will receive direct feedback on the remix, a 12-Step Controller from Keith McMillen, streaming of their remix on the MusicRadar and LANDR websites, and a 1-year LANDR Pro-Unlimited subscription. Third-place winners will receive a 1-year LANDR Pro-Unlimited subscription. Enter the contest here. Good luck!